My last foray into the Cairo Film Festival was to go see عصافير اانيل ("Birds of the Nile") last night. 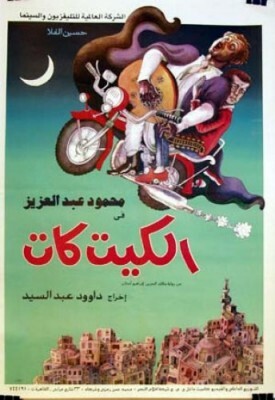 The film is based on the work of the novelist Ibrahim Aslan, which already inspired a great Egyptian film, the 1991 Kit-Kat. "Birds of the Nile" is no Kit-Kat, however. At least from what I saw: I didn't stay through the film. I'll admit that extraneous factors may have made me impatient, yesterday: I'd gotten up at 6am to go to Alexandria and back, and the Good News Cinema at the Hyatt for some reason played the film with the volume turned up to ear-splitting levels. In a more tolerant mood, I might have staid through the film--but I doubt my final opinion would have been different. From the trite and obvious sound track (funny music for funny scenes; sad music for sad scenes), to the indifferent cinematography, to the melodramatic clichés, to the voice-over narration, it all reminded me of a soap opera rather than a film. There was none of the lightness, irony and surprise of Alsan's work. Unfortunately, because I'd really been looking forward to this one.